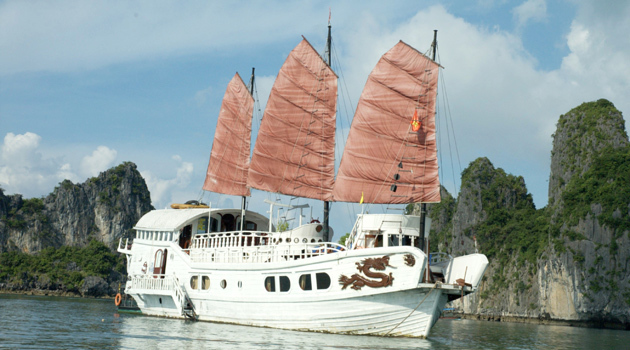 Based on the Ancient Halong Sail-Boat Style, the Red Dragon Junk is designed perfectly by wood, stone and bronze in harmony between tradition and luxury. 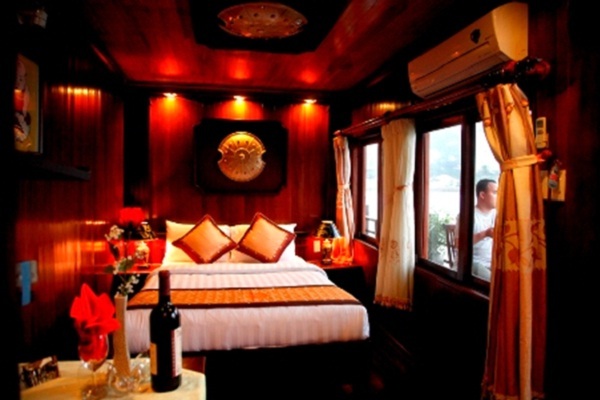 With a fully-equipped dining room, a deluxe cabin with en-suite bathroom, sunbathing and relaxing area, a professional kitchen, a captain cabin and a separate Staff ‘area. Made by the sophisticated woodworkers, the Red Dragon Junk offers an unforgettable masterpiece of art inside the boat. In addition, other Asian decorations proudly bring you a transient gleam of Asian culture. Even there are only 5 deluxe cabins (3 double, 1 twin, and 1 triple room) and 2 spacious sundecks with a capacity of up to 11 passengers, the Red Dragon Junk have set a focus on quality over quantity. Customer satisfaction is always the highest priority in the Red Dragon Cruise. Passengers will be served by well-trained and caring staff. As soon as you travel with Red Dragon Cruise, please enjoy a warm welcome from the crew on board and afterwards, you will be treated like royalty. Red Dragon Cruise operates 2 restaurants, one inside and one outside. Outdoor lounge will definitely indulge yourself that enables passengers’ souls to blend with nature. Besides, the cruise offers traditional music and dance, wedding, birthday anniversary, beach party and inside cave party upon requests. 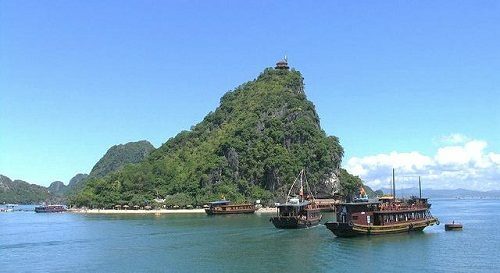 Other activities that should not be missed are bamboo rowboat, kayaking, caving and fishing.